Renault say they are launching legal action against Nelson Piquet Jr and his father Nelson Piquet over race-fixing allegations made against the team. Piquet Jr has given evidence to the sport's governing body that has led to an investigation into Fernando Alonso's win at the 2008 Singapore Grand Prix. Renault deny claims they asked Piquet to crash to facilitate Alonso's win and have referred to a "blackmail attempt". Piquet Jr said: "Because I am telling the truth I have nothing to fear." In a statement released on Friday, Renault said the claimed blackmail attempt was in relation to "allowing Mr Piquet Jr to drive for the remainder of the 2009 season". The Brazilian was dismissed by Renault in early August and has been outspoken in his criticism of Renault team boss Flavio Briatore since he was sacked after July's Hungarian GP. Renault - who said they were also referring the matter to police in the UK - have been called to attend an extraordinary meeting of motorsport's governing body, the FIA, on 21 September to answer the race-fixing allegations. If found guilty, the team could face severe sanctions which could include expulsion from the current F1 world championship. Briatore stressed that Renault had not commented on the case until now because the FIA had asked them not to. "I'm very confident the truth will come out... 80 or 90 per cent [confident]," he said at the Italian Grand Prix on Friday. "That is why we put forward the case. "I feel really, really upset and sad. What you see today - everything was against Renault, and there was a big damage already for us. This takes the sport into disrepute. "I feel Nelsinho is a very spolit guy, very fragile. We tried everything. All I wanted from him was only performance. "For me, it's completely unbelievable. Fernando won the race only because [Ferrari driver Felipe] Massa and [BMW's Robert] Kubica had problems. There were about seven problems that occurred. What is possible after lap 14 [when the crash occurred]?" In response to Renault's rebuttal, Piquet Jr released a statement reading: "I confirm that I have co-operated fully and honestly with the sport's governing body. "Because I am telling the truth I have nothing to fear, whether from the Renault team or Mr Briatore - and while I am well aware of the power and influence of those being investigated, and the vast resources at their disposal, I will not be bullied again into making a decision I regret." 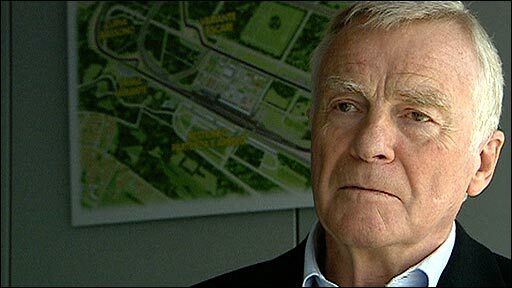 FIA president Max Mosley said on Friday that the governing body had spoken at length to Piquet Jr and were awaiting a response from Renault to a dossier they had sent to the team. "My personal reaction was to think that if this is true it's very worrying," Mosley said in an interview with BBC Sport. "But of course I know from endless experience [that] you think that's outrageous and then you hear the other side of the story and it's completely different. "As far as we're concerned they have to considered innocent until proven guilty. "I keep an open mind but if it were true it would be very serious. It could turn out that the whole story has no basis." Mosley added that Piquet has been promised immunity from being punished in return for giving evidence, as was the case when Lewis Hamilton and Fernando Alonso gave evidence in the McLaren 'spygate' scandal in 2007. McLaren were excluded from that year's constructors' championship and fined $100m (then equivalent to £49.2m) after being found guilty of illegally possessing confidential Ferrari technical data. Mosley said: "We have said to him that, and I don't know exactly how it was phrased, but he has been told that if he tells us the truth then he will not be proceeded against individually." 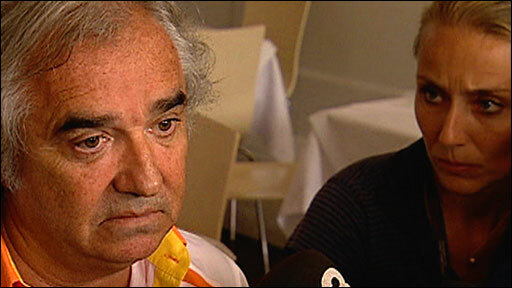 Reports have appeared on the internet claiming to quote extensively from Piquet's statement to the FIA. The FIA has promised to conduct an investigation to find out exactly where the information came from, while the Formula 1 Teams' Association (Fota) has criticised the leaking of information relating to the case. "Fota believes that differences within the sport should be handled in a professional manner and condemns the habit of intentionally releasing confidential documents to influence public opinion," it said in a statement. "Confidential documents should remain under the control of the competent authority." There has been speculation within F1 that the controversy is a means of removing Briatore from the sport following the row between Fota, in which he is an influential figure, and Mosley earlier this year. Brawn driver Rubens Barrichello said on Thursday: "It's very difficult to get a conclusion on this. But all I can say is that someone want's Briatore's head." But Mosley rejected those suggestions. "[Me] calling Flavio a loony is a sort of joke," he said, in a reference to a remark he made in a BBC interview at the British Grand Prix in June. "Flavio came before the end of July and we had lunch together and on a personal basis we are very friendly. If I had to choose somebody in the paddock to have as a guest he would be high on the list but that's completely separate from the question of whether this did or didn't happen. "You look at the facts unemotionally and if you are going to convict somebody you have to make sure they're guilty. Alonso won the Singapore GP in 2008 when Piquet crashed two laps after the Spaniard had come in for a routine pit stop." That meant that when race officials sent out the safety car to clear up the debris from Piquet's car, Alonso was alone among the front-runners in not having to stop for fuel and tyres. 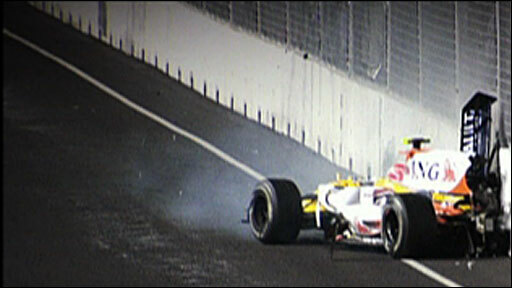 At the time, Piquet attributed the crash to a simple error. Alonso, who is currently preparing for Sunday's Italian GP, said on Thursday that he was "very surprised" by the race-fixing charge levelled at Renault. "I cannot imagine these things, these situations," he said. "It's something that never entered my mind. "For me it's not even the time to think about, or to pay attention to, this. "It's difficult to understand for me all this situation and this investigation. It is just too incredible."